TEHRAN (FNA)- A senior Orthodox Church official urged Christians to take up arms in Syria and defend themselves against extremists, condemning the international community for not stopping flow of arms to Syria militants. 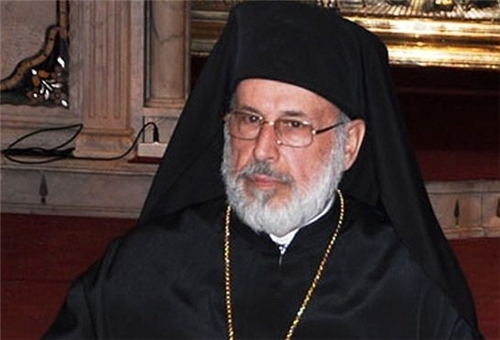 “I call on every young man who can take up arms to come forward,” Khoury said, adding that the initiative was meant to allow the community’s members to engage in self-defense and protect Christian holy places, which have come under attack recently, Al-Alam reported. “Our young people are ready; their fingers are on the trigger and they’re ready to fight for the sake of Syria and for the sake of self-defense,” said Khoury, the patriarchal assistant at the Antioch Diocese, based in Damascus. Asked about the 13 nuns and several orphanage workers who were seized last week by Al-Qaeda-linked militants and taken away from Maaloula to the nearby town of Yabroud, Khoury indicated they were unable to discuss their situation freely. The women appeared in video footage broadcast Friday by Al-Jazeera television and said they were being treated well after being forced to leave Maaloula due to heavy shelling. The militants who have taken the nuns away say they haven’t ‘kidnapped’ them. Khoury said that some 40 churches had been damaged during the war in Syria and blamed the international community for accepting the opposition’s version of events, like “the government is killing its people – they are seeing things with only one eye”. Khoury urged leading countries to instead make efforts to stop the flow of weapons into the country. In Lebanon, caretaker Energy Minister Gebran Bassil said the events in Maaloula, where the Syrian army has been trying to secure against Al-Qaeda-linked attacks, have been locked in a fierce campaign for the last several weeks, were having an impact on Christians in Lebanon and the rest of the world. Bassil told a news conference that it was time to act in order to halt “the series of attacks on Christians”. “Reactions in Lebanon, the Levant and the world haven’t been sufficient,” Bassil said, adding that a similar disappointing response followed the kidnapping of two Orthodox bishops in April. The minister proposed both prayer and large-scale peaceful demonstrations to express outrage over the targeting of Christians in the war in Syria.